Secret Convergence on Infinite Podcasts | The Fantastic Flame On! Announcing (sort-of, it’s been out there for a few days) Secret Convergence on Infinite Podcasts! As mentioned on this weekend’s Fantasticast, a whole slew of amazing podcasts are coming together from October 29th for a massive podcast crossover. We’re very pleased to signal-boost this event for a number of reasons. First, it sounds amazing. Secondly, one of the podcasts taking part is the excellent Rachel And Miles X-Plain The X-Men, who have taken the time on their show to give us some promotion, and we are more than happy to return the favour. Thirdly, one of the podcasts taking part is the excellent House To Astonish, and Al Kennedy joined us last summer for our coverage of Fantastic Four Annual #6. Mark your calendars for 29 October – nine of the top podcasts in the world of comic books, including The Fan Bros Show, Rachel & Miles X-Plain the X-Men and War Rocket Ajax, are coming together for a blockbuster crossover series of round-table discussions. The event, titled “Secret Convergence on Infinite Podcasts”, will feature each show in the line-up hosting one episode, with guests from the eight other shows making special appearances to chew over the weighty questions (and some not-so-weighty ones too). 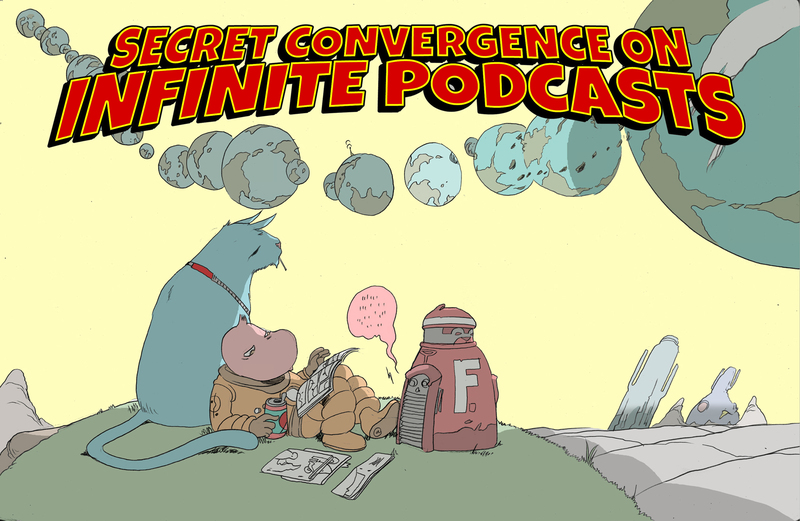 Secret Convergence on Infinite Podcasts features specially-commissioned art by top comics creators Brandon Graham and James Stokoe. It all starts on 29 October with Episode One (Fan Bros), which sees host DJ BenHameen welcome Graeme McMillan, Rachel Edidin and Chris Sims to finally answer the question of Who Would Win In A Fight? Episode Two (Into It with Elle Collins) features host Elle Collins alongside Helena Hart, Rachel Edidin and Matt Wilson and consideration of the best of Comic Book Movies. Episode Three (SILENCE!) has host Gary Lactus accompanied by Al Kennedy, Chico Leo and Kieran Shiach as they mull over Are Things Better Or Worse? In Episode Four (Less Than Live with Kate or Die) we join host Kate Leth as she talks The Comics We Sharewith The Beast Must Die, Elle Collins and Al Kennedy. Episode Five (Wait, What?) brings together host Jeff Lester and guests Paul O’Brien, Chico Leo and Gary Lactus to talk about Characters We Used To Love (Or Hate). Episode Seven (House to Astonish) sees host Al Kennedy discussing comic book Guilty Pleasures with Helena Hart, Jeff Lester and Elle Collins. Episode Eight (War Rocket Ajax) features hosts Chris Sims and Matt Wilson and guests Elle Collins and DJ BenHameen going in-depth on the topic of Comics Characters We Identify With. And Episode Nine (Rachel & Miles X-Plain the X-Men) assembles a formidably knowledgeable team, as hosts Rachel Edidin and Miles Stokes are joined by Paul O’Brien and Kieran Shiach to discuss matters of Complex Continuity. This entry was posted on October 11, 2015 at 6:01 pm and is filed under Uncategorized. You can follow any responses to this entry through the RSS 2.0 feed. You can leave a response, or trackback from your own site.